but know I have some.. mag/ca/ are at Red Sea pro salt levels.. alk too.. ph is low 7.7-7.8..
have a rsm 650.. do about 10 percent weekly changes.. but have been doing large changes past two weeks since this showed up.. did dose tank with prazzi..
Hi crew, firstly what a fantastic site! I have learned soooo much!! 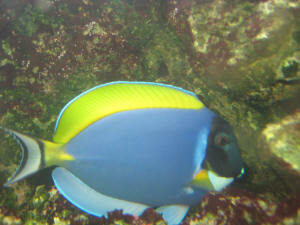 Although I have now hit a problem with a tang that has behavioural issues! or do you think this may have caused a reduction in DO in conjunction with the 30 gal change today? Thank you all so much for what you do! and another handful of red macro that I grabbed from the LFS without identifying. Temp: 81, SG:1.025, PH:8.2, Ammonia, Trites, Trates: 0. I do 10% weekly water changes. I have all the fish and there have been no changes to the tank, feeding or livestock for over a year. for something (anything!) that I could treat or at least identify. Nothing. It is a strange feeling to hope and wish that you identify something bad, but the lack of a desire to eat is a big deal for me (especially with this tang). I have never lost a fish in the 4 years I have had this tank going. All the of the other fish are fine. I was going to quarantine but I don't know what to treat for. Question: How would you debug this? What should my action be? What kind of time-frame do I have? I know that his immune system has probably already taken a hit due to the lack of food for a week, but he still looks quite plump? Thanks for the quick response. I re-tested all the levels to rule out water quality. Everything is at the proper level as listed in my previous mail. I can't think of anything that has changed environmentally in the past year. I am going to continue to try and guess at what is troubling this guy, but I am feeling rather hopeless. Awesome. I am glad I sent a picture, I had no idea this algae was toxic. I'll start daily 10% water changes (This is the fastest I can make water), siphon out as much algae as I can and add carbon. Think the Tang will make it? Firstly just like to say that your web site is a great resource and has helped me loads in the past! The problem I'm having I couldn't quite find this time though so am asking myself this time. I've had a 65 gallon tank now for just over a year and a half with 1 hippo tang about 4 inches long now, a yellow about 3 inches, a Sixline wrasse and two ocellaris clowns. The tank has remained with the same inhabitants and live rock arrangement with a couple of soft corals for the best part of a year with no real problems though I have lost a couple of snails and my cleaner shrimp did go missing about 6 months ago never to be seen again! after a look around I found him hiding in his little rock space or 'home' at first I thought maybe he's just a bit spooked from a 10% water change I did the night before but he didn't come out all night, I managed to get a good look at him using a combination of peeking through the gaps in the rock and hanging a mirror down the back of the tank and he looked fine, no skin damage ich or anything similar, his eyes looked ok and he was flapping his fins about like normal, so I was a little bit puzzled. just flapping his fins sometimes calmly other times fast like he's trying swim away and hide, I've put in a bit of flake food (which is used to eat all the time almost 'stealing' from the clowns), a few live brine shrimp which he definitely normally eats and hung a piece of dried seaweed in and he has completely ignored all of it, in actual fact the only reaction I did get is if I move the box about he loses colour and turns white (it returns shortly afterward). I'm getting worried about him now the last time I saw him eat anything was about 5 days ago and he's starting to look a bit skinny and his stomach has now got a small 'pinches' on either side. my tank has had a bit of an algae bloom so will try and reduce these. Don't know why it hasn't affected the corals and other inverts on LR though they all seem fine. Equipment is a canister filter, protein skimmer and two powerheads to increase flow inside tank. Please any advice will greatly appreciated he's my fave fish and has so much personality, I hope I don't lose him.